New And Noteworthy: When Did The Best Chance for Confederate Independence Occur? 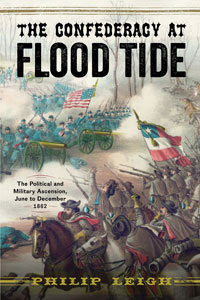 The Confederacy at Flood Tide: The Political and Military Ascension, June to December 1862, Philip Leigh, Westholme Publishing, 288 pp., $28.00. The Fleeting Moment When the Confederate States of America Had the Best Opportunity to Achieve Independence and Why Their Efforts Failed. The first six months of 1862 provided a string of Federal victories in the West at Mill Springs, Fort Donelson, Pea Ridge, and Shiloh. In May, New Orleans fell, and Union General George McClellan’s army was so close to the Confederate capital of Richmond, Virginia, that the troops could set their watches by the city’s church bells. But then the unexpected happened. In June, Robert E. Lee’s Army of Virginia pushed McClellan’s much larger army back to the James River. In Europe, Confederate diplomats sought international recognition for the Confederate States of America, which was made even more attractive now that a shortage of cotton made the powerful textile interests anxious to end the war. Further tipping the balance, in July, the Confederacy secretly ordered two of the latest ironclad ships from England’s famous Laird Shipyard—the same yard that built the commerce raider Alabama. These steam-powered ironclads would be far superior to anything in the Federal navy. While the “high tide” of the Confederacy is often identifed as Pickett’s Charge during the Battle of Gettysburg in July 1863, the most opportune time for the Confederacy vanished seven months earlier, coinciding with President Abraham Lincoln’s Emancipation Proclamation in December 1862 and the failure of the secessionist states to be recognized as a sovereign nation. As Philip Leigh explains in his engrossing new book, The Confederacy at Flood Tide: The Political and Military Ascension, June to December 1862, on every battlefront and in the governmental halls of Europe, the Confederate effort reached its furthest extent during the second half of 1862. But with the president’s proclamation, the possibility of slave revolts and decline in the production of the very products that were sustaining the Southern economy became real; coupled with Europe’s decision to reject Confederate overtures and halt the sale of the ironclads, the opportunity for Confederate success ended. The Confederacy would recede, and the great battles of 1863 and 1864 only marked the Southerners’ tenacity and stubborn belief in a lost cause. About the Author: PHILIP LEIGH is an independent scholar and contributor the New York Times “Disunion” series which commemorated the Civil War sesquicentennial. He holds an engineering degree from the Florida Institute of Technology and an MBA from Northwestern University. He is the author of Trading with the Enemy: The Covert Economy During the American Civil War and Lee’s Lost Dispatch and Other Civil War Controversies, both available from Westholme Publishing. CWL: Having read Philip Leigh's other books, it is likely that The Confedereacy at High Tide continues to weaves a strong narrative and analysis to engage the conventional wisdom about an historical question. CWL always takes away adeeper understanding of the questions that Leigh addresses. He produces accessible considerations of crucial incidents. Leigh offers a fine blend of ideas with concurrent military, political and economic events occcuring in America, Mexico, Canada and Europe. Overall, Leigh has continuously offered work that move forward scholarship of the American Civil War era.